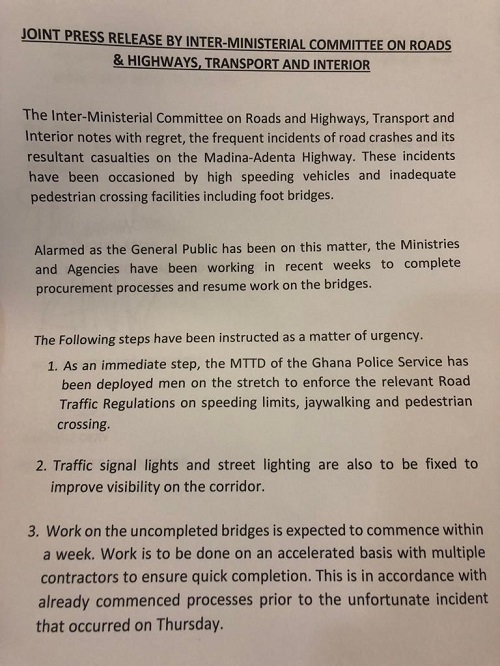 Work is to commence on the uncompleted footbridges on the Madina-Adenta highway from next week following the recent spate of fatalities, the government has said. A student of the West African Senior High School at Adenta is feared dead after she became the latest to be hit by a car on the highway on Thursday afternoon. Like a number of the fatalities, she was trying to cross the highway. “Traffic signal lights and street lighting are also to be fixed to improve visibility on the corridor,” it added. The police have however been condemned for manhandling some of the protesters. Over 190 people have been knocked down on the stretch in 2018. Residents have intensified protests over the lack of footbridges on the road in recent times following multiple deaths in the past week. After the Thursday accident, residents blocked the road and set fire to tyres. 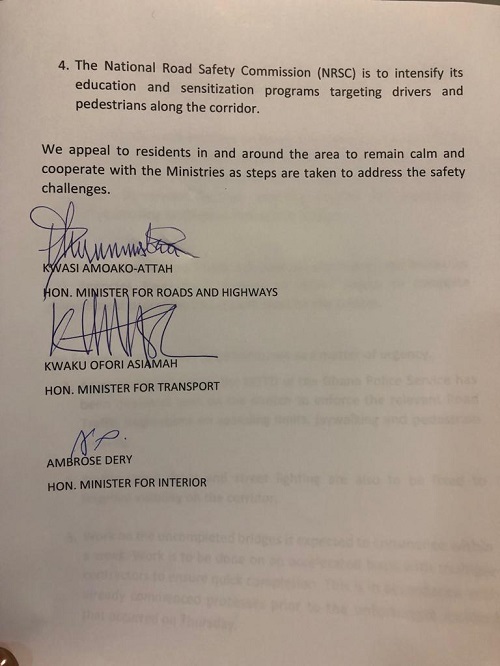 In response to this, the MTTD instructed the Greater Accra regional MTTD command to deploy more men to the Adenta-Madina-Aburi road to check over speeding and other road offenses. It was initially thought the contractor on the road would return to work after three months. The MP for the area, Alhaji Boniface Saddiq Abubakar, had said the Ministry of Roads and Highways was in talks with the contractor of the Madina-Adenta highway to return to the site and complete construction of the footbridges. “Apparently the contract was not cancelled. But unfortunately, NDC was not dealing with the contractor because they were not making payments to the contractor and so he had to withdraw his services,” the minister said.